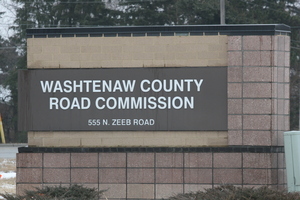 Posted on Wed, Mar 14, 2012 : 5:56 a.m.
Two joint projects on Maple Road between Scio Township and Ann Arbor Township are among the 2012 road projects that will be discussed by Scio and Washtenaw County Road Commission officials Wednesday afternoon. Tree removal, roadside berm removal, shaping of the road and the addition of limestone are part of these two projects on Maple Road from Stein Road to 400 feet south of Joy Road and from Stein Road south to the pavement. The two projects total $147,500, and Scio Township’s portion would be $73,750. The township spent about $66,700 on primary road maintenance projects in 2011 while about $1.02 million was spent throughout the township on road projects. Among the major projects was the overlay of Wagner Road from Jackson to Miller Road and Parker Road from Jackson to Dexter-Chelsea Road and crack and chip sealing of Scio Church from Strieter to Zeeb Road. The township spent about $23,000 on local road projects that included about $12,000 in dust control on roads throughout the township and tree and drainage work on Maple Road. In total, about $427,000 work was performed on township roads. Park Road from Staebler Road to Liberty Road - shaping of the road and the addition of 6,500 tons of limestone at an estimated cost of $80,000. Marshall Road from Baker Road to Parker Road - shaping of the road and the addition of 4,300 tons of limestone at an estimated cost of $52,500. Staebler Road from Park Road to the pavement - shaping of the road surface, ditching, berm removal and the addition of 1,100 tons of limestone at an estimated cost of $19,900. Rose Drive from Wagner Road east to the end of the pavement - pulverize the surface and add 4 inches of asphalt to the surface and shoulder work at an estimated cost of $72,400. Tubbs Road at Huron River Drive - shaping of the surface, ditching and the addition of an approach and shoulders at an estimated cost of $12,350. Scio Township will have $958 more in local road matching fund money to work with in 2012. In 2011, the township used $37,230 in local matching funds and this year, that total is $38,188. Officials will also discuss the use of $7,157 in draining matching funds. Scio Township has 33.50 miles of certified gravel roads and last year applied two solid applications of dust control. One application costs about $12,260. Scio Township and Road Commission officials will meet on Wednesday at 3 p.m. at Township Hall, 827 N. Zeeb Road.